One of the intriguing things about abortion is the gap between the public voices on the issue and the rest of us. Most of the people who write and speak about it are quite clear and definitive that abortion is either murder or an unqualified right of a woman to control her own body. Polls indicate that a large majority of the public has a much more complicated view. We think that both a woman should have the right to an abortion and that abortion is morally suspect, if not wrong. Tony Kaye’s second film and first documentary, Lake of Fire, has the virtue of approaching the issue from where most of us are coming from. Kaye denies that his film has a political bias, but it does. Tony Kaye was born in London in 1955, studied fine arts, became a commercial artist, then directed ads and later music videos. In 1990, hoping to make movies, he relocated to the U.S. Preternaturally drawn to controversy, he decided to make a documentary on the abortion issue. So seventeen years ago he began finding abortion centers that would cooperate, shooting film there, and researching and interviewing antagonists on both sides of the issue. He used his own money and went bankrupt in the process. In the midst of this odyssey, he directed American History X (1998), about a reformed, neo-Nazi skinhead who tries to save his brother from going down that same path. It did less than $7 million at the box office, but did three times that overseas, garnered an Academy Award nomination for its star, Edward Norton, and was well received by critics. Unfortunately, Kaye fought with the studio about the final cut of his film (hardly unusual) and then took his grievances public with an advertisement in the industry trade paper Variety (very unusual and unusually dumb). That ended his career as a possible studio director, and he returned to Lake of Fire. Kaye’s fascination with the American right wing grounds at least half of his documentary. He has wonderful footage of fundamentalist Christians who not only think abortion is murder, but that killing abortion doctors is heroic. Even those who are formally against killing "baby killers," clearly have sympathy for those who shoot them or blow up abortion clinics. 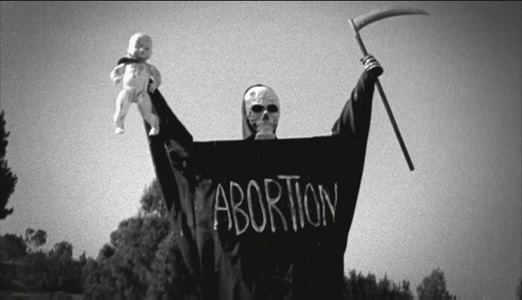 Everyone connected with abortion is going to hell, which is described by several of them as a "lake of fire." These people are fascinating and horrifying, and it’s appalling to see the bodies of those they murder or the faces of those disfigured in their bombings. Unfortunately, the majority of the right-to-lifers whom we meet are extremists. Much less visible are those who believe abortion is immoral and should be outlawed, but would never sanction killing and maiming- think every Republican President and GOP elected official. Kaye does a much better job of capturing the sensational than the mainstream of the anti-abortion movement. Given this extremist emphasis, his film ends up discrediting the anti-abortion movement, but not their message. In fact, Lake of Fire is powerfully upsetting in how it makes the anti-abortion case. We are shown very graphic footage of aborted fetuses. Of course those from late-term abortions look human, but what’s shockingly unsettling are first term fetuses. They look unmistakably human, and only an epic capacity for denial would label them as "no different from an appendix" or "waste material" or any of the other euphemisms that one can find in the literature. This is not to say that they’re human beings. But it is to say that the majority of women and men who feel abortion is morally suspect if not wrong have a vivid basis for that intuitive judgment. Kaye will be criticized, no doubt, for this unsettling footage. But it is, literally, the skeleton in the closet of all of us who do believe in the right to an abortion. The most interesting of the talking heads turn out to be Noam Chomsky and Alan Dershowitz. They both convey the hopelessness of the debate. They contend that each side has a rich and defensible moral position. Each side has arguments that cannot be wished away. And both men clearly believe in a woman’s right to choose and that abortion is not morally neutral or defensible by logical, moral values that are self-evidently right. Lake of Fire isn’t only graphic images and debate. We also hear from the children of slain abortion doctors, those who witnessed or were maimed in assaults on clinics, those who suffered when abortion was illegal, and those whose lives would be severely damaged if they were forced to carry a fetus to full term. All of this is achingly powerful, and at two and a half hours, Kaye should have given us some quantitative respite from this qualitative assault. Kaye believes he has made a neutral documentary. But by focusing on the extremists, he has made their anti-abortion position appear largely insane. Yet by showing us the images of aborted fetuses, he leaves us deeply unsettled about abortion. Kaye best captures that murky middle where most Americans reside in the last section of the movie. There we meet and follow one woman as she has an abortion. We see her understandable anxiety and determination in the morning, we are in the room with her when she has it, and we sit with her afterwards in the recovery room. We understand the many reasons behind her breaking down and sobbing. She bravely conveys the invasiveness of the procedure, the release of anxiety, her understanding that a form of life inside her has ended, and her relief that she can now get on with her life. Kaye’s beautifully shot film doesn’t so much leave us discouraged by the polarization of the two sides, though it does that. More deeply, it leaves us saddened and weary because abortions are tragic and necessary, and it weighs on the soul to have to hold on to both of those truths.